Just got the desk for Christmas from my wife! 2 Ikea (of course) Alex drawers in gray, with a Karlby 74″ top in walnut. 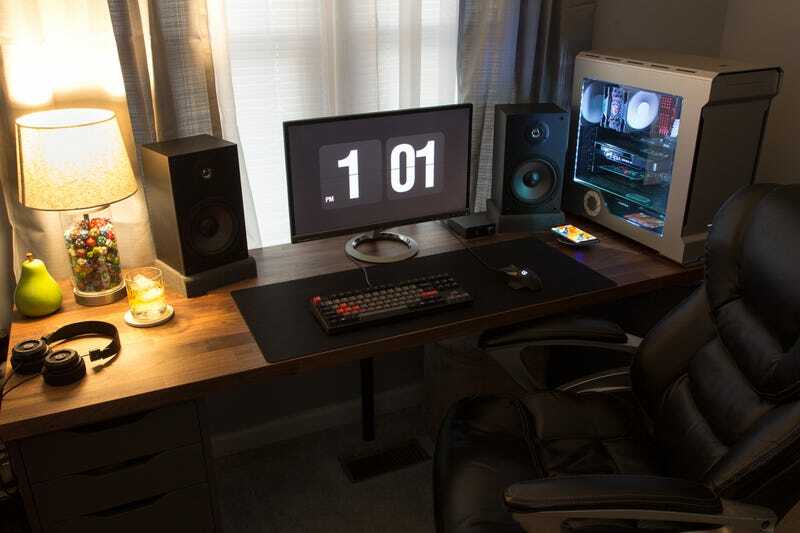 Very solid desk! The monitor is an Asus 23″ IPS (MX239H). I love someone who loves music while they work—or while they play, and this workspace is ideal for all of the above. There are a few more photos in the gallery below, including one of a great-looking media shelf that’s full of movies and other interesting tidbits, and another featuring the resident of one of the turntables…at least the one who has to get out of the way when scruffycowendale wants to use it. Trust me, they’re adorable.